Large Caliber Contactless IC Card Gas Meter is used for industrial gas supply. It is suitable for measuring the flow of natural gas, coal gas and liquid gas. It is composed of shell, inside mechanical core and counter. 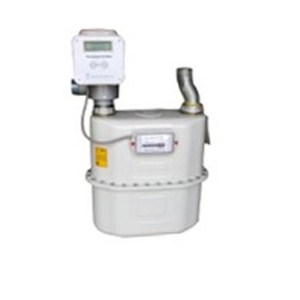 A non-reversible device can prevent the counter reversion.All the technique items comply with State Nation GB/T6968-1997 Diaphragm Type Gas Meter. 1. Prepaid, contactless IC card patent technique, water proof and anti-attack. Its inside circuit is sealed with high performance sealant, so it can work normally even under humid environment. 2. Micropower energy consumption technique. 3. Power by 4 pieces of AA alkaline batteries and automatically close valve when change batteries. 4. Compact size, light weight, high sensitivity and accuracy. 6. Moving parts are self-lubricating materials with lower friction, which can prolong the service life of meter. 7. Inside simple absolute structure is suitable for different kinds of gas, can filter and precipitate the impurity or dust. 8. Whole meter design against illegal access. 9. High quality internal plastic and stainless metal components, internal and external protection with powder painting guarantees a long service life.